A sheet of fibres which were just collected from the liquid suspension with the screen. The next steps are to press it and to dry it. The Diamond Sutra of the Chinese Tang Dynasty, the oldest dated printed book in the world, found at Dunhuang, from 868 CE. The art, science, and technology of papermaking addresses the methods, equipment, and materials used to make paper and cardboard, these being used widely for printing, writing, and packaging, among many other purposes and useful products. Today almost all paper is manufactured using industrial machinery, while handmade paper survives as a specialized craft and a medium for artistic expression. In papermaking, a dilute suspension consisting mostly of separate cellulose fibres in water is drained through a sieve-like screen, so that a mat of randomly interwoven fibres is laid down. Water is further removed from this sheet by pressing, sometimes aided by suction or vacuum, or heating. Once dry, a generally flat, uniform and strong sheet of paper is achieved. Before the invention and current widespread adoption of automated machinery, all paper was made by hand, formed or laid one sheet at a time by specialized laborers. Even today those who make paper by hand use tools and technologies quite similar to those existing hundreds of years ago, as originally developed in China and Asia, or those further modified in Europe. Handmade paper is still appreciated for its distinctive uniqueness and the skilled craft involved in making each sheet, in contrast with the higher degree of uniformity and perfection at lower prices achieved among industrial products. While monitoring, regulations and action by concerned citizens, as well as improvements within the industry itself are limiting the worst abuses, papermaking continues to be of concern from an environmental perspective, due to its use of harsh chemicals, its need for large amounts of water, and the resulting contamination risks, as well as trees being used as the primary source of wood pulp. Paper made from other fibers, cotton being the most common, tends to be valued higher than wood-based paper. Hemp paper had been used in China for wrapping and padding since the eighth century BCE.. Paper with legible Chinese writings on it has been dated to 8 BCE,. The traditional inventor attribution is of Cai Lun, an official attached to the Imperial court during the Han Dynasty (202 BCE-220 CE), said to have invented paper about 105 CE using mulberry and other bast fibres along with fishnets, old rags, and hemp waste. Paper used as a writing medium had become widespread by the 3rd century and, by the 6th century, toilet paper was starting to be used in China as well. 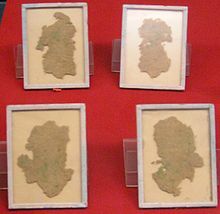 During the Tang Dynasty (618-907 CE) paper was folded and sewn into square bags to preserve the flavour of tea, while the later Song Dynasty (960-1279 CE) was the first government to issue paper-printed money. In the 8th century, papermaking spread to the Islamic world, where the process was refined, and machinery was designed for bulk manufacturing. Production began in Samarkand, Baghdad, Damascus, Cairo, Morocco, and then Muslim Spain. In Baghdad, papermaking was under the supervision of the Grand Vizier Ja'far ibn Yahya. Muslims invented a method to make a thicker sheet of paper. This innovation helped transform papermaking from an art into a major industry. The earliest use of water-powered mills in paper production, specifically the use of pulp mills for preparing the pulp for papermaking, dates back to Samarkand in the 8th century. The earliest references to paper mills also come from the medieval Islamic world, where they were first noted in the 9th century by Arabic geographers in Damascus. Traditional papermaking in Asia uses the inner bark fibers of plants. This fiber is soaked, cooked, rinsed and traditionally hand-beaten to form the paper pulp. The long fibers are layered to form strong, translucent sheets of paper. In Eastern Asia, three traditional fibers are abaca, kozo and gampi. In the Himalayas, paper is made from the lokta plant. Today, this paper is used for calligraphy, printing, book arts, and three-dimensional work, including origami. Modern papermaking began in the early 19th century in Europe with the development of the Fourdrinier machine. This machine produces a continuous roll of paper rather than individual sheets. These machines are large. Some produce paper 150 meters in length and 10 meters wide. They can produce paper at a rate of 100 km/h. In 1844, Canadian Charles Fenerty and German F.G. Keller had invented the machine and associated process to make use of wood pulp in papermaking. This innovation ended the nearly 2,000-year use of pulped rags and start a new era for the production of newsprint and eventually almost all paper was made out of pulped wood. Five seminal steps in ancient Chinese papermaking outlined in a woodcut. Papermaking, regardless of the scale on which it is done, involves making a dilute suspension of fibres in water, called "furnish", and forcing this suspension to drain through a screen, to produce a mat of interwoven fibres. Water is removed from this mat of fibres using a press. Screening the fibre involves using a mesh made from non-corroding and inert material, such as brass, stainless steel or a synthetic fibre, which is stretched in a wooden frame similar to that of a window, this tool being knows as a paper mould. The size of the paper is governed by the open area of the frame. The mould is then completely submerged in the furnish, then pulled, shaken and drained, forming a uniform coating on the screen. Excess water is then removed, the wet mat of fibre laid on top of a damp cloth or felt in a process called "couching". The process is repeated for the required number of sheets. This stack of wet mats is then pressed in a hydraulic press. The fairly damp fibre is then dried using a variety of methods, such as vacuum drying or simply air drying. Sometimes, the individual sheet is rolled to flatten, harden, and refine the surface. Finally, the paper is then cut to the desired shape or the standard shape (A4, letter, legal, etc.) and packed. The wooden frame is called a "deckle". The deckle leaves the edges of the paper slightly irregular and wavy, called "deckle edges", one of the indications that the paper was made by hand. Deckle-edged paper is occasionally mechanically imitated today to create the impression of old-fashioned luxury. The impressions in paper caused by the wires in the screen that run sideways are called "laid lines" and the impressions made, usually from top to bottom, by the wires holding the sideways wires together are called "chain lines". Watermarks are created by weaving a design into the wires in the mould. Handmade paper generally folds and tears more evenly along the laid lines. Handmade paper is also prepared in laboratories to study papermaking and in paper mills to check the quality of the production process. The "handsheets" made according to TAPPI Standard T 205  are circular sheets 15.9 cm (6.25 in) in diameter and are tested for paper characteristics such as brightness, strength and degree of sizing. A modern paper mill is divided into several sections, roughly corresponding to the processes involved in making handmade paper. Pulp is refined and mixed in water with other additives to make a pulp slurry. The head-box of the paper machine (Fourdrinier machine) distributes the slurry onto a moving continuous screen, water drains from the slurry (by gravity or under vacuum), the wet paper sheet goes through presses and dries, and finally rolls into large rolls. The outcome often weighs several tons. Another type of paper machine makes use of a cylinder mould that rotates while partially immersed in a vat of dilute pulp. The pulp is picked up by the wire and covers the mould as it rises out of the vat. A couch roller is pressed against the mould to smooth out the pulp, and picks the wet sheet off the mould. While papermaking was considered a lifework, exclusive profession for most of its history, the term "notable papermakers" is often not strictly limited to those who actually make paper. Especially in the hand papermaking field there is currently an overlap of certain celebrated paper art practitioners with their other artistic pursuits, while in academia the term may be applied to those conducting research, education, or conservation of books and paper artifacts. In the industrial field it tends to overlap with science, technology and engineering, and often with management of the pulp and paper business itself. Some well known and recognized papermakers have found fame in other fields, to the point that their papermaking background is almost forgotten. One of the most notable examples might be that of the first humans that achieved flight, the Montgolfier brothers, where many accounts barely mention the paper mill their family owned, although paper used in their balloons did play a relevant role in their success, as probably did their familiarity with this light and strong material. Key inventors include Henry Fourdrinier, Heinrich Voelter and Carl Daniel Ekman, among others. Wikimedia Commons has media related to Manufacture of paper. ^ a b Needham, Joseph (1986). Science and Civilization in China: Volume 5, Part 1. Taipei: Caves Books, Ltd. Volume 5, p. 122. ^ "World Archaeological Congress eNewsletter 11 August 2006" (PDF). ^ Papermaking. (2007). In: Encyclopædia Britannica. Retrieved April 9, 2007, from Encyclopædia Britannica Online. ^ Needham, Joseph (1986). Science and Civilization in China: Volume 5, Part 1. Taipei: Caves Books, Ltd. Volume 5, p. 1. ^ Needham, Joseph (1986). Science and Civilization in China: Volume 5, Part 1. Taipei: Caves Books, Ltd. Volume 5, p. 123. ^ Mahdavi, Farid (2003). "Review: Paper Before Print: The History and Impact of Paper in the Islamic World by Jonathan M. Bloom". Journal of Interdisciplinary History. MIT Press. 34 (1): 129–30. doi:10.1162/002219503322645899. ^ Loveday, Helen. Islamic paper: a study of the ancient craft. Archetype Publications, 2001. ^ Lucas, Adam (2006). Wind, Water, Work: Ancient and Medieval Milling Technology. Brill Publishers. pp. 65 & 84. ISBN 90-04-14649-0. ^ a b * Hunter, Dard (1978) [1st. pub. Alfred A. Knopf:1947]. Papermaking: The History and Technique of an Ancient Craft. New York: Dover Publications. ISBN 0-486-23619-6. ^ "The Atlas of Early Printing". atlas.lib.uiowa.edu. ^ Needham, Joseph (1986). Science and Civilization in China: Volume 5, Part 1. Taipei: Caves Books, Ltd. Volume 5, p. 4. ^ "Forming Handsheets for Physical Tests of Pulp" (PDF). TAPPI. Retrieved 2016-04-30. ^ Biermann, Christopher J. (1993). Handbook of Pulping and Papermaking. San Diego: Academic Press. ISBN 0-12-097360-X.